All business owners know that representing the vision that is their company in a tangible way is not an easy thing to do. How can one possibly capture everything their business offers in just a logo let alone spending tons of money on signage or swag?? Thanks to technology you can take a lot of the burden and expense off of your conscience and have a little fun by learning to use a laser cutter for your business. Get an understanding of configuring both our Epilog Zing and BOSS laser for various types of projects relevant to your business. You’ll learn the correct materials for your project be it display signage, business cards, or give aways for events for your customers.As always, attendees will also learn safety basics and general operation of both laser cutting software and the laser itself. This workshop covers tool configuration and operation of the laser itself. This class does not cover designing files or branding for your business. There is no pre-requisite for this course other than the burning desire to make amazing things for your company.Attendees will have the opportunity to laser engrave a business card during this workshop. If you have a business logo you’d like to engrave please bring your logo in .jpg or .pdf format on a flash drive to the workshop. Jasmine Quinsier is a passionate maker professionally and in her free time. She’s defining and breaking the boundaries at the intersection between the drawn image and its digital counterpart. 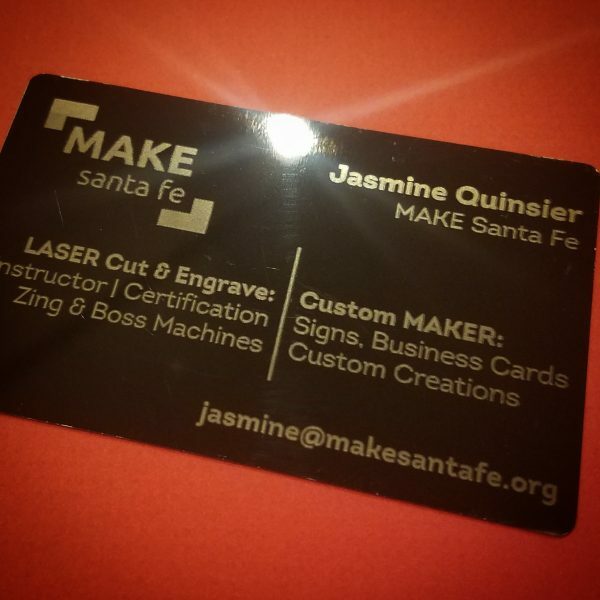 As part of our laser training team Jasmine overflows with positive energy and a true passion for creating using one’s hands, software, design, and laser cutting technology.